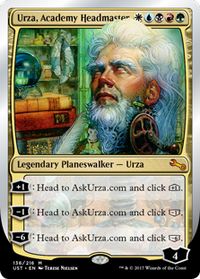 -7: Search your library for up to two planeswalker and/or creature cards, put them onto the battlefield, then shuffle your library. darkone8 thanks for your comment! As far as budget goes, having almost all the cards passed down from 2 generations to me made my life a bit easier for those big boi cards, and newer cards are still being printed so thats nice! 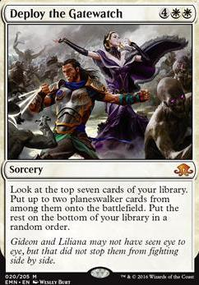 Alternatively her -7, grabs you 2 more planeswalkers from your deck, and places them directly into play! Usually you have Doubling Season in play when you ult her, so why not ult 2 more planeswalkers while you're at it! Nissa, Vastwood Seer Flip was actually in this deck before, the problem is, her flip isn't very powerful. You barely want to ult her, same with Party Jace, and a couple other planeswalkers that are there for there + and - abilities. I wanna ult these bois! Nicol Bolas, Planeswalker will be added though! Unfortunately it's not in my collection just yet, but once it is I will include him. The question is who to take out? Noting how you don't seem to be running on any sort of a budget, I'm just going to throw out a couple of the other planeswalkers to replace a few of the ones you have that aren't that good (Like Samut, the Tested , who isn't effective since your deck doesn't have much to do with creatures). 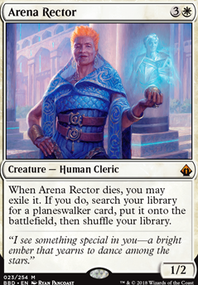 My personal suggestions would be to play some planeswalkers that have +1/+1 counter abilities, like some of the Ajanis do help boost Ramos's ability. Also, I would play some of the flip planeswalkers (like Nissa, Vastwood Seer Flip) and I would personally play Nicol Bolas, Planeswalker because of the control options it offers. If any Planeswalker is going to show up, my money is on Samut. While yes, Vivien also watched her world destroyed by Bolas, we as an "audience" actually watched it happen to Amonkhet. She'd be the perfect lens to see the hate and war through and would keep us grounded in what's at stake. So, in memory of Amonkhet, here's a 4-ability Samut. +2 Target creature you control gets +3/+3 until end of turn. You may have it fight target creature you don't control. +1 For each nontoken creature you control, add in any combination and . 0 Samut, Enraged Vendetta becomes an X/X Legendary Creature with doublestrike, haste, and trample until end of turn where X is her loyalty. All damage dealt to her is reduced by half, rounded down until end of turn. 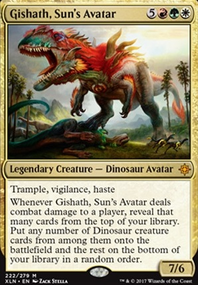 -10 Search your library for up to six creatures and / or Planeswalkers and put them onto the battlefield. Put a vendetta counter on each of them. They gain haste, hexproof, and indestructible as long as they have a vendetta counter on them. Shuffle your library. A little bit of Vivian / Garruk / Domri / Sarkhan, a dash of Xenagos, a pinch of Gideon (out of color, of course), and a powerful homage to Samut, the Tested . I'll have to take a look at the deck more in depth, but anytime someone says they want to cheat out creatures in Naya, a few cards come to mind. Nahiri, the Harbinger obviously for her ultimate. Samut, the Tested gets you two creatures, or a creature and a Planeswalker if you have out Doubling Season, or two Planeswalkers if you are greedy. Garruk, Caller of Beasts works great to T3 - T4 something massive like Gishath, Sun's Avatar. I'm not sure how well the consistency would work in EDH, but I find a wild amount of success with See the Unwritten in Modern. 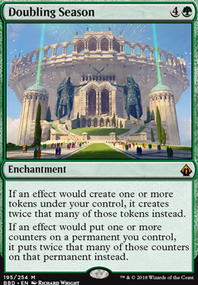 I see you're not running Tribal, but hey you have a decent chunk of your creatures as Angels and Elves, so Descendants' Path may be worth while? Keep in mind Samut, the Tested is no longer Standard legal, however. I do enjoy the premise.